Hugh Jackman is the ideal leading man for a musical: he's handsome, he can act and brother, can he put over a song. 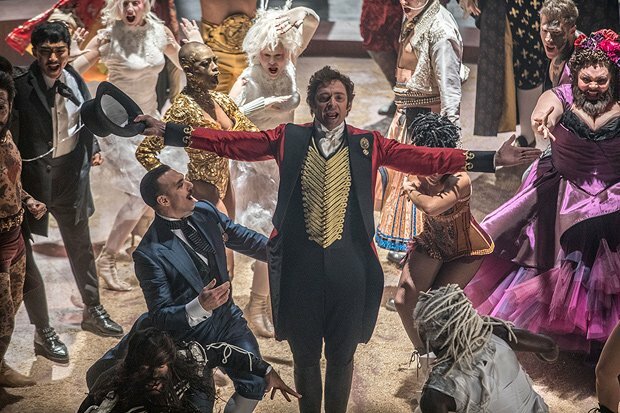 In an imaginative, original musical celebrating Phineas Taylor Barnum, the legendary 19th century showman and genius of hype, Jackman has the charisma, charm and cheek that Barnum must have possessed in some measure. He has a twinkle that keeps you sympathising with him even when he's being a deeply flawed, social climbing, straying hero. The film folds together several of PT Barnum's enterprises under a caring, sharing umbrella theme of celebrating diversity – as he displays 'freaks', opens a museum of 'curiosities', amuses Queen Victoria and promotes the hottest ticket of 1850, the US tour of the 'Swedish Nightingale', chandelier-shattering operatic superstar Jenny Lind (Rebecca Ferguson). The real Barnum never shied from making a buck by enticing people to stare at differently abled or rarely afflicted 'exhibits', but here he is creating a family and spreading the love with the dwarf billed as General Tom Thumb (Sam Humphrey), the Bearded Lady (Keala Settle, who knocks the gloriously defiant, Golden Globe-nominated 'This Is Me' out of the park), conjoined twins, giants and albinos. Meanwhile, devoted wife Charity (Michelle Williams) goes along with most of his shenanigans and reversals of fortunes but puts her foot down when the seductive Lind turns Phineas's head. There is a younger romance between Zac Efron as Barnum's posh business partner and Zendaya's trapeze artist, the two of them just adorable and almost stealing the show with their sensationally executed big number 'Rewrite the Stars'. That and the rest of the songs, by Oscar-winning La La Land lyricists Benj Pasek and Justin Paul (also Tony winners for current Broadway hit Dear Evan Hansen), are an infectious contemporary mix of anthemic pop, hip hop and power ballads, facilitating eye-popping dance routines. First-time director Michael Gracey, previously a visual effects artist, certainly grasps the business of show, filling the screen with a kaleidoscopic, family-friendly spectacle that frequently delights – from throwback Gene Kelly-ish dance numbers for Jackman and Williams, to stampeding elephants. And Jackman's Barnum is a rock star. General release from Tue 26 Dec.
A musical version of the life of showman and genius of hype PT Barnum (Jackman), and how he went from running a museum of ‘curiosities’ to promoting Swedish soprano Jenny Lind (Ferguson). Jackman has rock-star charisma and Gracey delivers a kaleidoscopic, family-friendly spectacle. Saw the movie today- blown away-brilliant-loved it-already recommended it to friends. Amazing, loved it. Can’t wait to see it again. Highly recommend it. My 15yr old daughter also loved it. This film has to be the best one I have seen. I have been to see it 10 time if it unforgettably brilliant. Took my husband to grandkids ant excuse to see it, fantastic.